‘Game of Thrones’ Season 8: Will Jaime, Tormund, Beric become White Walkers? Will we see some of the main characters turn into White Walkers in 'Game of Thrones' season 8? “Game of Thrones” season 7 ended with The Wall crumbling, paving way for the Night King and his army of White Walkers to cross beyond. With the army of the dead marching North, there are bound to be casualties along the way. The White Walkers are expected to multiply and even some of our beloved characters are bound to be transformed. Nicolaj Coster-Waldau teased the death of some main characters in a past interview. However, whose fate will succumb to the Night King in Season 8? The season 7 finale definitely teased Tormund and Beric's demise. After all, they were at The Wall when the Night King attacked. Will Jaime turn into a White Walker? Actor Nicolaj Coster-Waldau, who plays Jaime Lannister in “Game of Thrones,” previously talked about the consequences the White Walkers bring in season 8. He talked about the grim fate of some of the other characters in the series. He teased that some blue-eyed characters are bound to turn into wights. Of course, he did not reveal who among the blue-eyed cast will be the casualties in the great battle with the White Walkers. However, did he hint at his character’s demise in season 8? It is unlikely though that Jaime will turn into a White Walker given speculations that he is the “valonqar” whom Maggy the Frog referred to in her prophecy. In season 5, the old woman told a teenage Cersei that she will die at the hands of the “valonqar,” which means “little brother” in High Valyrian. Jaime and Cersei are twins, although Jaime was born a few minutes after Cersei. If Jaime turns into a wight, it is unlikely that he will still remember his sister and single her out just to kill her. But then there is also the possibility that Tyrion is the little brother in the prophecy. What will happen to Tormund and Beric in “Game of Thrones” season 8? 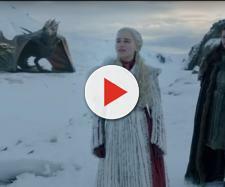 When season 7 ended, we saw Tormund Giantsbane and Beric Dondarrion try to flee as the Night King demolished The Wall with the help of his dragon. We saw them in shock as they watched The Wall crumble. The Wall collapsed and we did not see them again. Did they make it out alive? It definitely does not look good for Tormund and Beric where season7 left off. Their fate is a big cliffhanger that season 8 will address. It may be safe to assume though that they died and turned into White Walkers. However, a fan theory suggests that the pair made it out alive since they ran across the wall unlike the other watchers, who ran down the steps and met their death.